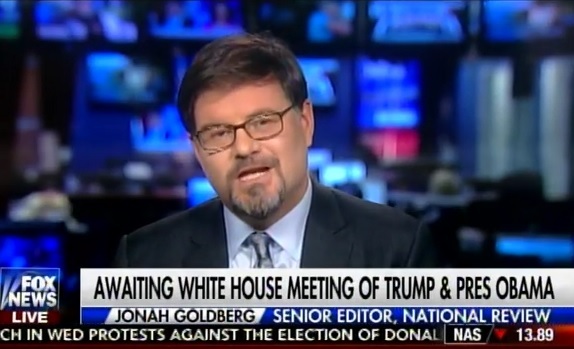 #NeverTrumper Jonah Goldberg has insulted Donald Trump and his supporters for over a year now. On Thursday after Donald Trump thumped Hillary Clinton Clinton in the national election, Jonah told America’s Newsroom that basically any Republican could have beat Hillary Clinton. Jonah Goldberg: There’s an enormous amount of emphasis on, and I understand why, on Donald Trump’s victory, but people need to pay a little more attention on Hillary Clinton’s loss. Donald Trump basically performed at the same, at parody of Mitt Romney. It was a Hillary Clinton crater. Jonah: With some groups but overall it was a low turnout election. MacCallum: But what you’re suggesting is that another Republican would have beaten Hillary and I’m not sure that’s actually true. Jonah: It’s unknowable. But I think it is true. But it’s unknowable. He’s lost so much of his credibility and support in the past year. And, he still doesn’t get it. According to The Corner (which Jonah Goldberg founded) TRUMP would have beaten Obama in 2012.